Thursday, July 20 – Police are reminding boat and dinghy owners to consistently lock and secure these vessels to docks and yachts as theft of these items are beginning to rise. 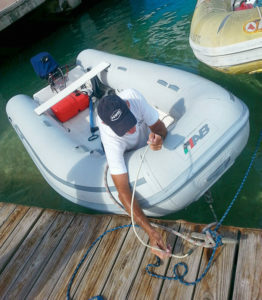 Charters boat companies are also urged to instruct visitors and guests to do the same. A number of reports were made within the last week of missing dinghies docked at marinas in Road Town and Cane Garden Bay. Annually, RVIPF records an increase in reported theft of boat and parts primarily engines during the summer months. Parents and guardians are encouraged to ensure that youngsters are engaged in wholesome activities during their vacation. Premises should be searched regularly for any strange or unexplained items. Anyone with information about possible suspects or these stolen items is asked to contact the RVIPF Intelligence Unit at 368-9339 or detectives within the Criminal Investigations Department through the RVIPF three-digit access number 311.